I love geeky things. Computer games, comics, toys and machines. It all comes under my @geek status or remit. There is only one brand that takes care of all of these things in one fell swoop. 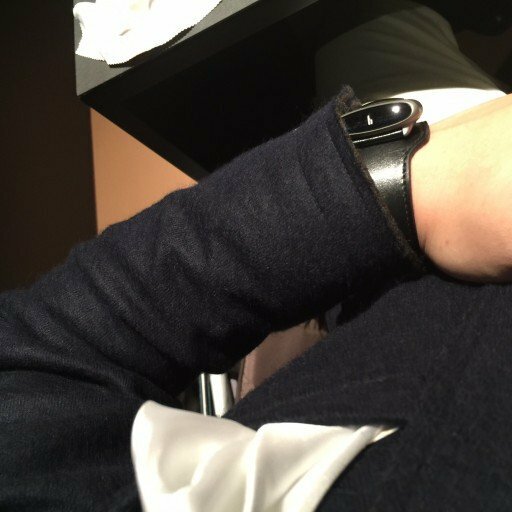 That is RJ-RomainJerome. I not only got a chance to see a lot of pretty toys, I also got to see some things in person that I have waited a hell of a long time for. 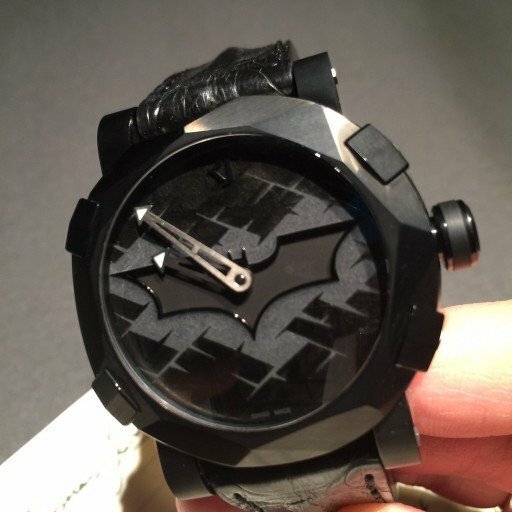 Such as the 75th Anniversary Batman watch. And here it is in all of its glory! Just look at the edges and shapes on the case. 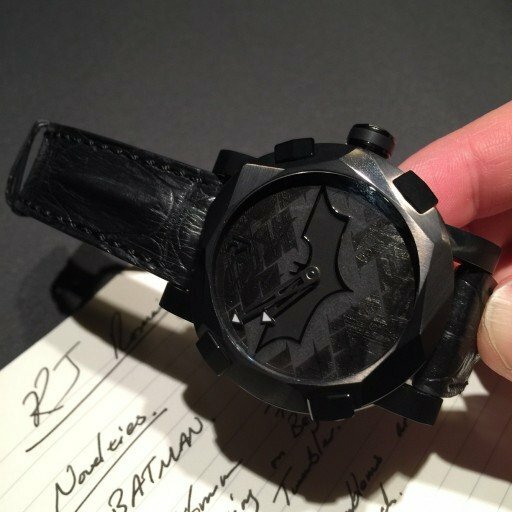 The faceting on the bezel is there to reflect the design of the Tumbler from the Dark Knight Universe. Next up we have one of the new additions for this year’s Baselworld from RJ-RomainJerome. The Subcraft, a new take on the original Spacecraft. Rather in the unending void that is Space, we are now taking a look at Internal Space. The oceans. The new oval shaped case and dial aperture on the top give it a real submarine/ nautical feel. The case is a brushed titanium and feels gorgeous to the touch. The case feels a little smaller too in comparison to the Spacecraft, more importantly it does not snag on a shirt cuff quite like its Space bound brother. The time is displayed by a ‘digital’ display for the hours on the front of the case, then there is a minute dial on the top of the case. At the 12 o’clock position is where you will find the crown for any adjustments you may need to make. Sleeker and cooler, more understated but still very interesting. Like it. The Berlin wall fell 25 years ago and with the East Side Gallery RJRomainJerome were able to produce a Berlin-DNA piece with nods to the history of the Iron Curtain. Using original material recovered from the Wall itself, RJRomainJerome had to create a new process to be able to produce the final dial design. It outlined the city and the path the Wall took as well as the river itself. The point is that the dials show in miniscule scale some of the buildings in the city. All with super sharp corners. which in any moulding process is very hard to maintain. You and understand that many a dial was wasted and disposed of. 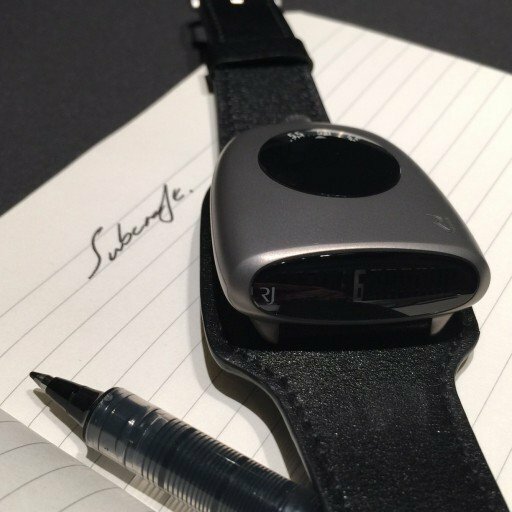 The material the dial is made of is fine powdered Berlin Wall concrete, which is then formed and mixed with other additives to form a paste. This paste is then placed into a silicon mould which has the design in it. A cast is made and then turned out. Once it has passed all the quality checks it is the mounted on a plate for the dial. This plate gives the brittle material a support. You will also see that the trace of the wall and the river are painted. What you won’t realize is that under the colored paint is a substantial amount of Luminova. Under blacklight or after a lot of exposure to sunlight, the lume really shows up. A great nod to a momentous event in history. I think the most important of it all is the fact that there is a substantial amount of work that goes into these pieces which we as journalists and buyers do not see. Next time more geeky goodness from RJRomainJerome!